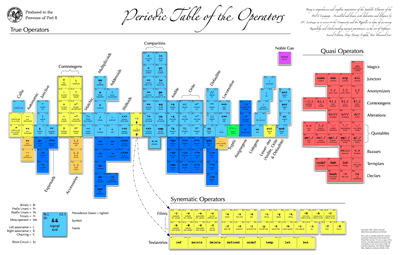 The sources are primarily Michael Lazzaro's "Perl Operator List, TAKE 6", Larry Wall's Apocalypse 3: Operators and Luke Palmer's Synopsis 3: Summary of Perl 6 Operators. I had to guess a bit at the precedence levels, and choose to leave out some of the "maybe" operators. The classification scheme is wholly my invention and fancy. I will be happy to update this chart from time to time as Perl 6 takes form. May 28th: Released the Second Edition which I think brings it up to date with all current thinking. You can now buy a print of the poster via cafepress.